I did my third 10K run in a row this weekend and it felt great. Contrary to what I initially thought I would feel, I’ve actually been dreading my shorter runs during the week more than the long runs. During the long runs, ususally at about the halfway point (5K), running becomes more subconscious and less taxing, so I always find it more enjoyable than trying to pummel down 5K at 6:30 in the morning. My sister Julia informed me that this is called a “runner’s high”, but I hesitate to identify myself as a runner still, so right now I’d like to refer to this weird feeling as more of a temporary insanity a la mango. As emvandee referred to in the comments, I’ve been looking more into carb-loading myself, too – whee! Typically I’ve been avoiding carbs for dinner if possible, but now knowing that I have to run within 12 hours of finishing dinner, I have more excuses to work pasta and bread into our evening meals. 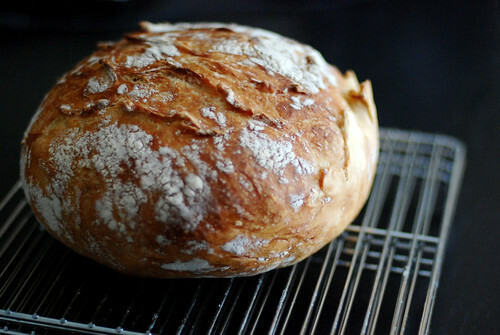 First up, something I’ve been dying to try, the New York Times No-Knead Bread by Jim Lahey. It’s one of the two recipes that got made super-famous by New York Times – the second one being The Best Chocolate Chip Cookies that I kicked off Cookie of the Fortnight with. Ahhh freshly baked bread – Alex’s grabby hands were swatted away in this picture. Put a big empty mixing bowl on a scale and set scale to 0. Dump in 470g flour (I used all-purpose, but I think you can also use bread flour) and 10g sea salt. Add in 1/4 tsp instant yeast. Use a spatula and toss everything together to mix it up a bit. Add in 350g lukewarm water. Stir everything together with your spatula gently but firmly, but don’t start whipping or beating just because you’re wielding a spatula. That’s it! Cover bowl with plastic wrap and let sit at room temperature for about 12-18 hours. I usually start the mixture the night before, and bake in the evening. The dough is ready for the next step when its surface has lots of air bubbles. Lightly flour a work surface, put dough on it and pull both sides so it looks like Dumbo’s ears. Fold the ears in. Turn 45 degrees, repeat. Cover with plastic wrap while you move on to the next step. Coat a kitchen towel with flour, wheat bran or cornmeal and move your dough, seam side down, onto the towel. Try to shape it like a ball if you can, and dust with more flour, bran or cornmeal. Cover with towel and let rise for about 2 hours. If it’s even possible (and it is), the dough will be more than double in size and will not readily spring back when poked with a finger. Preheat oven to 450 degrees at least 45 mins before baking. Put a 6- to 8-quart heavy covered pot (cast iron, enamel, Pyrex or ceramic) in oven as it heats. Remove super hot pot from oven and be very careful here! Everything is super hot! Sprinkle the bottom of the pot lightly with flour or cornmeal. Pick up the dough with the towel on the bottom and invert into the pot. Don’t owrry if it looks messy on top, just make sure it’s not super lopsided. Cover with lid and bake for 30 minutes. Take out the lid (hot!) and bake for another 15 to 30 minutes, until loaf is beautifully browned. 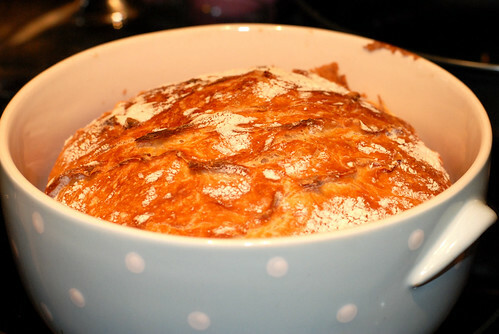 Give the bread a couple of minutes to settle once out of the oven, then remove it from the pot (should be very easy if you did everything right, i.e. sprinkled flour when you were supposed to). Cool on a rack. Let cool completely before cutting – otherwise, Clothilde’s right, the crust gets all rubbery and not crunchy. Boo! 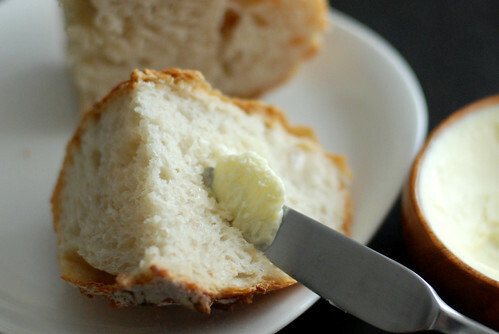 We might’ve cut into this a little earlier than we should’ve, but the homemade butter was crying out for its friend. Highly recommend it – it’s so easy, and so good!